It's been one of PC gamingkind's most frequent inquiries over the past six months: " When in the Zeus is the PlanetSide 2 beta starting? " Sony Online's been soft on answering as it chisels away at its hyper-ambitious massive FPS, but they're finally ready to give a semi-firm answer: "Within the next month." These words of confirmation come courtesy of Executive Producer Josh Hackney in the debut of SOE's community video series PlanetSide Command Center , which just posted. If you scored a beta key from a PlanetSide 2 PC Gamer issue, take comfort: you'll be one of the first to play our favorite game of E3 . 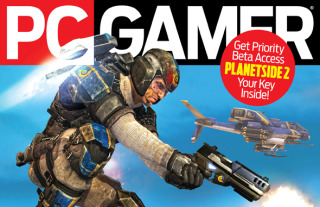 Below, the UK and US PlanetSide 2 issues of the magazine, respectively.